With the world turning to more greener solutions for all our power woes, Solar energy is the most feasible and one which is been used successfully world over. The Goal Zero, an American Company, an innovator in solar generator kits and solar powered panels has come out with the Yeti series of portable solar generators. The Yeti series is more like a power bank and not mere solar generators as they can be charged in ways other than using solar panels. In this segment we will focus on the Goal Zero Yeti 400 solar generator which is simple and silent. This solar generator kit should become an essential part of your camping gear when you are out of the grid or have its own place in your emergency tools kit for all the unforeseen happenings of today’s world – be it a natural disaster or man-made. Let us see why this solar generator portable as it is can be of such significance. Charge Solution when out of grid: Goal Zero Yeti 400 is not dependent only on the Sun to get charged where it gets 120 watts of solar power. It can also be charged by plugging into the wall outlet or by plugging into your car’s 12 volt adapter. The built in charge controller ensures that the battery doesn’t get overcharged. A perfect solution to all your charging woes when out camping in the wild. Your devices need never run out of charge: Be it your laptop, Smartphone, MP3 player, portable reading light or other essential electronic gadgets you can always charge them with the Yeti 400 because it has a USB port and sockets that are suitable for all these gadgets and supplies 300 W continuous power when fully charged. Environmental friendly: There are no hazardous fumes to deal with, no noise to bear with- the Goal Zero Yeti 400 is a silent worker where the solar panels quietly absorb the sun’s heat energy and convert it into the AC power required for all the above said gadgets. Not dependent on fuel: You needn’t worry about running out of fuel anymore with the solar generator kit. The solar panels can be charged adequately in the sun or you can use electricity from your wall socket to keep the unit charged. Indoor use: Because of the lack of harmful chemicals and toxic fumes, the Yeti can be safely used indoors. It is also very quiet, another reason to use indoors. Maintenance friendly: Solar generator portable or not is easy to maintain because of the minimal number of parts involved. Simple to store: When at home keep the Yeti plugged in, if that is not an option than fully charge it every 3 months and store in a cool place for it to be ready when you are ready to move. No return policy: God forbid if you are unhappy with the purchase then it is a pricey bargain thanks to the no return policy. Longer charging time: The solar powered generator when entirely dependent on the sun for charge takes probably the longest to charge in the portable solar generators range. Moreover it cannot be recharged in the evening. Unable to support high power consumers: The Yeti 400 can’t unfortunately supply ample power for your refrigerator and other power hungry devices. The market for solar powered generators, especially portable ones is still small and there are very few players in the market. As a result the competition is tough and the similarities many; yet the Goal Zero Yeti 400 scores over its nearest rivals in a few major and key issues. Looks that endear: Sleek, compact and stylishly designed this solar powered kit has all its wires and cables neatly organized and in place. A sturdy handle: Just lift and take it as conveniently as any other price of luggage thanks to its sturdy and ergonomic handle. Lightweight: When compared with its nearest rivals, the Goal Zero Yeti is lightweight. USB port: Not all the portable solar powered generators come with a USB port; it is a very nice touch in this unit. Battery: The lead acid battery has a long shelf life of 3 months unlike the Li-ion batteries in some brands. As a result the Yeti 400 can charge all your electronic devices almost double the number of times when compared with its competitors. Choose the power you need: Since there are no built in solar panels that come with Yeti you are at a liberty to choose the capacity of the panel best suited for your needs. This is highly advantageous because you are not stuck with certain wattage. This also reduces the price of the unit significantly. Size Matters: The Be Prepared Solar generator is built with similar configuration wherein it too can be charged via an AC adapter, has a sturdy handle, is portable and has a 100 amp battery. But here too Yeti scores because the Be Prepared Solar is bulky and huge when compared to the Yeti 400 which is sleek and compact. Of course the performance of the Be prepared is better because of its 100 W solar panel, but then it also costs over $1000 almost double the price of the Yeti. Standard Design: The Yeti series always follows a standard design and a tested concept unlike its competitors who have only rough designs for their solar powered kits. Thus we see that when buying a solar generator kit you should pay heed to the price, its utility value for your specific need and the overall use of the product. Since most of the solar powered generators are expensive, do not forget to look out for solar generators for sale where you can get good deals. 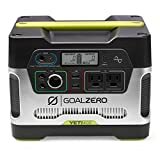 The Goal Zero Yeti 400 is at a very affordable price in comparison with the rest of the portable generators. The Goal Zero Yeti 400 solar generator kit is best suited for those who like to be prepared. Those who want to be ready for the power outages and any other electrical supply failure can depend on this robust compact generator which is completely safe to be used indoors because of the lack of toxic fumes and noise associated with a standard diesel generator. In addition to that the Yeti can be conveniently charged even at the wall outlet. If you are the kind who loves the outdoors and camping is a way of life, the Yeti comes handy there too. It is portable, fairly lightweight and can be carried like a small briefcase thanks to a thoughtful handle. The built in LCD helps you keep track of the power input and output and also gives an indication of the battery charge. This remarkable pure-sine wave inverter ensures that it is compatible with all AC electric devices like your laptop, Smartphone, MP3 player, DSLR and other gadgets which use less than 400 watts. The next time you are out camping, make sure you have the Goal Zero Yeti 400 with you because it belies its size and is immensely capable of powering all your vital instruments. The Yeti is a simple and silent generator of power when you need it the most be it on your outdoor expeditions or indoors. The makers have shown a lot of social responsibility by building a unit which is environment friendly and does not pollute with noise and harmful smoke; it just quietly charges under the sun waiting to be service when required.